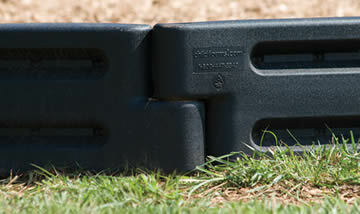 Our rubber tile playground surfacing offers highly resistant fall protection for your playground structures. Solid colors include black, red, green, or blue. Black rubber playground tiles with different color fleck options are also available. Each rubber playground tile measures 2 feet long by 2 feet wide. They’re 2-1/4″ thick. The rubber playground tiles are designed to permit water to flow through them, so water does not puddle on the surface. So, the play area can be used soon after rainy weather moves on. Rubber tiles must be installed over blacktop, concrete, or a layer of compacted, crushed gravel. 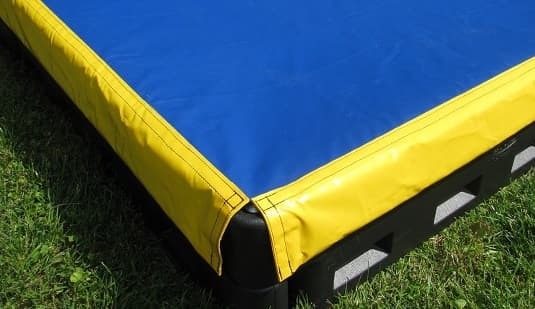 They cannot be installed directly over grass or dirt. 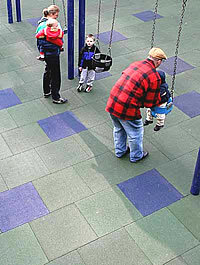 We can send rubber tile playground surfacing to you anywhere in the U.S. Unfortunately, we can only install the rubber tiles in the Maryland – Washington, DC – Virginia area. Prices start at $21.99 per tile (adhesive sold separately). For more information on rubber tile surfacing, please phone us at 1-877-840-0707 TOLL FREE.